This has long been a favorite of mine. 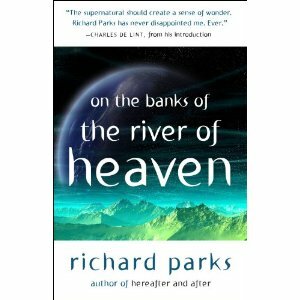 It was originally published back in April 2008 in Realms of Fantasy magazine and was the title story of my third collection, On the Banks of the River of Heaven (Prime Books, 2010). The story is based on the Japanese Star Festival (Tanabata) of July 7th, which in turn was based on an older Chinese legend. Once a year, the Divine Weaver and the Divine Herdsman (Vega and Altair) would meet across the Milky Way (the River of Heaven) to renew their love. The legend goes that their intense affection for each other caused them to neglect their duties, the Weaver to make clothes for the gods, the Herdsman to keep the Celestial Ox out of the gods’ gardens. So they were separated and only allowed to meet once a year after that. Naturally, in my version things were a little more complicated. But nothing that couldn’t be sorted out with good will and a little help from friends in unlikely places. Edited to Add: Note and Disclaimer: The Story Time link will always point to the current story, whatever it happens to be. As soon as a new one goes up, the previous one goes away. There is no archive, I’m afraid, so get them while they’re here. This entry was posted in Collection, Folklore, legends, magazines and tagged Divine Cowherd, Divine Weaver, On the Banks of the River of Heaven, River of Heaven, Star Festival, Tanabata by ogresan. Bookmark the permalink.